Delta Elevator has significant experience manufacturing, installing and maintaining a wide assortment of freight elevators, both standard and custom designs. Delta’s engineering and manufacturing departments develop some of the most robust freight elevators in the industry. Traction elevators are ideal when rapid speed and heavy lifting capacity are required to transport a high volume of freight. Microprocessor-based dispatching and state-of-the-art VVVF AC motor control. 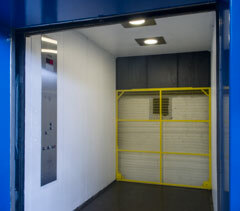 Delta’s hydraulic elevators are the economical and reliable solution for handling freight. Choose from Delta’s standard freight elevators or draw on Delta’s strong engineering department to meet your custom needs.